The Thermo Scientific Precision 285 Water Bath is easy-to-maintain with precise digital control. This laboratory water bath has a smooth stainless-steel interior chamber and an corrosion and chemical resistant epoxy powder-coated exterior. With a push of a button the Model 2845 Water Bath’s temperature can be set up to 99.9ºC with a ±0.1°C precision and automatic over temperature protection circuitry and cut offs that eliminates thermal runaway to protect samples. This microprocessor controlled water bath has a radiant three-digit LED display and front mounted controls making it very easy to operate. 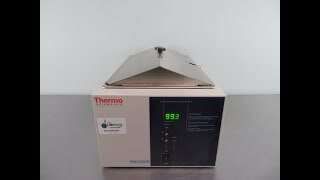 The Precision 2845 Water Bath by Thermo scientific comes with a stainless-steel diffuser shelf and a stainless-steel gable cover that channels away condensation to prevent it dripping back down onto the samples. The Precision line of water baths are ruggedly built, and and long lasting, making it a lab staple. This Thermo Precision 285 Water Bath has been fully inspected and is performing without issue. All of our lab equipment comes backed with our standard warranty. Should you have any questions, please don't hesitate to contact us.